Valerie Flanagan had been away from school for 37 years when she made the decision to redirect her life by earning a college degree. She was working full time as a health care assistant, but envisioned a career as a social worker, teaching parenting skills to teenage mothers. Valerie enrolled in classes at Onondaga Community College and was awarded an associate degree in Human Services in May 2017. Her next step was to enroll at Syracuse University as a part-time student through University College. “Acquiring a degree at this point in my life when I am actually close to retirement requires passion and determination,” she said at the time. Tragically, Valerie would never witness the fulfillment of her dream. She died last September after a brief illness. 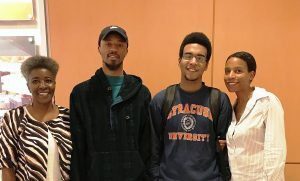 Valerie’s son, Kemet High, is currently enrolled in the master’s degree program in magazine, newspaper and digital journalism at the Newhouse School of Public Communications, after graduating last year from the College of Arts and Sciences. During his time at Syracuse, Kemet made the most of every opportunity to become involved and expand his skillset. He did internships at Atlantic Records and Revolt TV, a digital cable music network founded by Sean “Diddy” Combs. Kemet also interned at The Fader, a New York City magazine that covers music, style and culture. He was a member of Alpha Phi Alpha fraternity, and he was a founding member of Mixtape magazine, the University’s first and only magazine devoted to Hip Hop. Valerie’s niece, Angela Flanagan, was the oldest of four children in a household where education was highly valued. All four earned bachelor’s degrees, and three went on to earn master’s degrees. Angela was determined to finish her degree despite numerous real-life responsibilities. In 1996 she was a single mother to son Brendan while working at Newhouse as a production assistant. “I had the good fortune to get a job that provided tuition benefits for employees, so I enrolled as a part-time student through University College. It was a great start for a better future,” Angela says. It took many years, and it wasn’t easy, but Angela persevered semester after semester. “Attending college as an adult can be intimidating,” Angela recalls, but she was focused on her son and wanted to be a role model for him. She completed her degree in 2002, and her good intentions have come to fruition. Brendan is enrolled at Syracuse University as a part-time student through University College, pursuing a degree in psychology. He works part time at Kinney Drugs, and is weighing future career options, including being a psychologist. Brendan’s aunt Valerie won’t be here to see him graduate, but her words resonate in the educational path he has chosen.